The advent of cutting-edge technologies, such as AI and Internet of Things (IoT), has revolutionized the way businesses across sectors are viewing their offerings. This argument, perhaps, is most applicable to the current state of the global connected vehicles market. Autotech, in fact, was one of the top areas for VC investment in 2017. From connected cars to connected commercial trucks, the industry is incorporating tech that, as early as a decade ago, could only be found in works of science fiction. The rapid incorporation of mobility and cloud technology in the automobile sector is enabling the provision of seamless on-the-go-experiences such as advanced navigation, connectivity, and smart safety. Moreover, the increased importance of the mass customization across car segments is driving the need for personalized solutions. And the evolution of the connected vehicle market is sure to speed up the process. The global growth of connected vehicles market, according to Netscribes’ research, is en route to a promising future. The report, studying the 2014-2022 period, states that the global connected vehicle market, including connected cars and trucks, will show a compound annual growth rate (CAGR) of 19 percent. In terms of revenue, the collective sector shows the potential to transform into a USD 112 billion industry by the year 2022, with the North American market alone contributing over USD 21 billion. The substantial growth predicted for the market is not without reason. A quick look at the major trends will reveal the avenues of possibilities the sector has the potential to create. One such trend in the connected vehicles sector is the integration of devices with cars. Most cars today are equipped with various device connectivity tools, but device integration will truly transform the driving experience. For instance, speech integration along with the use of applications to receive and transfer data will improve the human-machine interface. Devices integrated with the vehicle’s onboard diagnostic (OBD) system are capable of transmitting real-time data and driving patterns allowing for a smoother drive and a more managed system. Safety is another aspect that can greatly benefit from superior connectivity. In fact, Netscribes reports the inclusion of safety solutions in new cars has risen to 49% in 2017 from 10.2% in 2012. Looking for information on the connected vehicle market? Save research time by requesting the Netscribes report. However, as exciting as the possibilities, there are quite a few challenges that will need to be addressed on the road to the evolution of the market. One of the primary concerns that will require attention is that of pricing. Consumers may be reluctant to bear premium costs associated with embedded connectivity solutions. Moreover, rising fuel prices and the thus affected global economy could deter the rate of adoption of these technologies. Another challenge the industry faces is the lack of a unified business protocol across regions. Without a globally accepted model, developing Vehicle to Vehicle (V2V) or Vehicle to Infrastructure (V2I) programs could prove to be a difficult task. 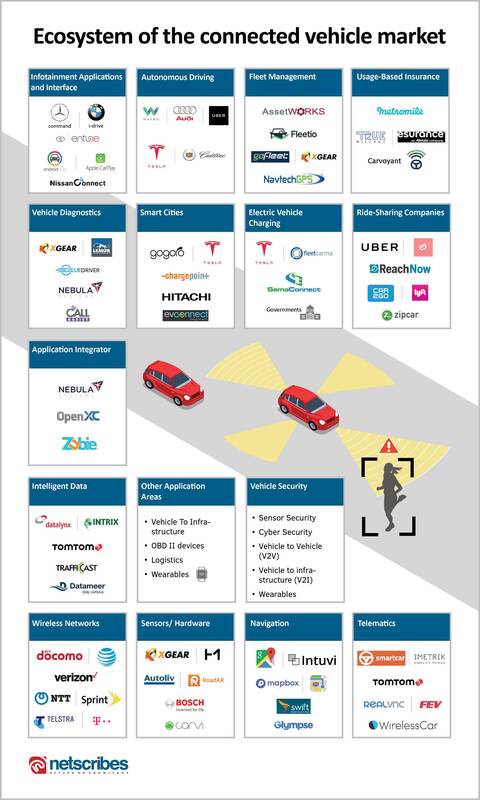 As the connected vehicles market grows to accommodate more services under its canopy, so does the adjoining ecosystem. For instance, the growth of usage-based insurance (UBI). With the help of sensors and integration with a vehicle’s OBD, insurers will be able to provide solutions based on the vehicle’s usage. Due to its specialized nature, this service offering includes various custom features like automated emergency callout, theft tracking, and breakdown data. This will obviously improve the vehicle telematics as well as help eliminate insurance frauds. 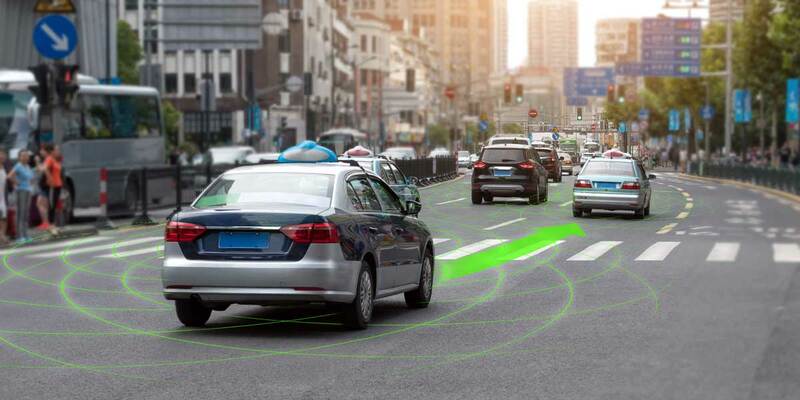 Autonomous driving is another such aspect that could see a growth simultaneous to the connected vehicles industry. The level of automation could range all the way from an advanced driver assistance system (ADAS) to complete automation through automated driving systems (ADS). The latter would require absolutely no human interference. Some of the most beneficial impacts of autonomous driving include a reduction in accidents and reliable travel time estimations.